AKIPRESS.COM - A crowdfunded campaign to fly a giant "Trump Baby" balloon over London during President Trump's visit next month has smashed its fundraising target, collecting more than $16,000 for the planned protest. But there's one problem: London Mayor Sadiq Khan has said no, CBS News reported. The diaper-clad "Trump Baby" stands nearly 20 feet high, sports the president's signature blond hair, and holds a cellphone in his very small hands. "Donald Trump is a big, angry baby with a fragile ego and tiny hands," the group behind the effort wrote on their Crowdfunder page. "Moral outrage is water off a duck's back to Trump. But he really seems to hate it when people make fun of him." 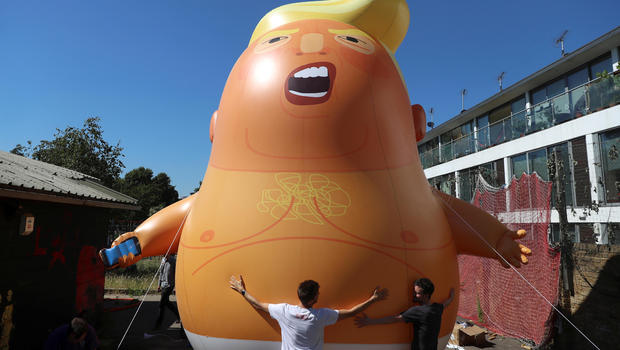 Khan, however, has not given the group permission to fly the balloon at London's Parliament Square because, the activists say, the "Trump Baby" does not qualify as a protest. "They are insisting that the only form of protest that is legally allowable on their land is 'a gathering of people, with banners and placards,'" they write.